A veteran Illinois cop used his department's youth Explorer post as a piggy bank for years -- laundering the cash then spending it on everything from adult websites to travel expenses -- before committing suicide in September his "extensive criminal acts" would be revealed, police said. Fox Lake Police Lt. Charles Joseph Gliniewicz was 52 and nearing retirement, after more than 30 years with the police department, when he died by a "carefully staged suicide" in September, which a Lake County official called "the ultimate betrayal." Police were initially investigating his death as a homicide and undertook an extensive search for three suspects that Gliniewicz radioed in about. An investigation alleged Gliniewicz was committing "extensive criminal acts" for seven years, including stealing and laundering money from the Fox Lake Police Explorer Post, which helps youth who are interested in careers in law enforcement. Thousands of dollars were used for personal purchases, including adult websites, mortgage payments, travel expenses and a gym membership, officials said. The Fox Lake Law Enforcement Explorer Post 300 website lists Gliniewicz as an advisor. Gliniewicz was also found to have forged signatures and official documents, officials said. Details were not clear. "The stress in his life began six months ago," Lake County Major Crimes Task Force Commander George Filenko said today, when, according to Gliniewicz's text messages, he was feeling pressure with new management in the Village of Fox Lake. According to officials, the Village of Fox Lake had begun conducting an internal audit of its assets, which would have eventually led to the discovery of the officer's alleged criminal actions. "What we found out through the text messages was the ongoing criminal activity. And through the bank statements. That’s when we started piecing it together," Filenko said. Lake County Coroner Dr. Thomas Rudd said today Gliniewicz was depressed during the final few weeks of his life. "I would presume that this individual, the lieutenant, obviously knew he had legal problems," Rudd said. "I think he knew there was the possibility of incarceration. His view in the community would be greatly diminished." "We know that he was depressed during the final few weeks," Rudd said. "Untreated depression results in suicide 90 percent of the time. So based on that information this to me is a suicide, not something that he just decided to wound himself for some reason." 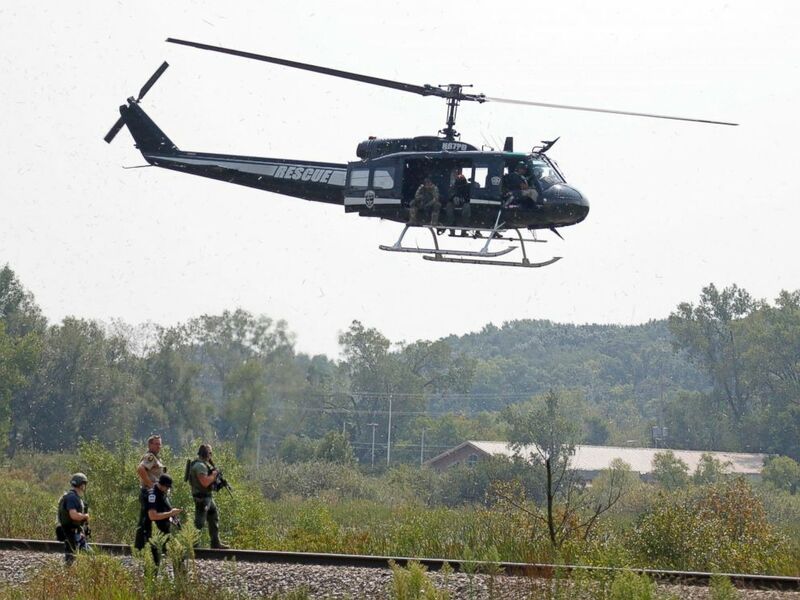 PHOTO:Police on foot and in the air search for suspects in the shooting of a police officer, Sept. 1, 2015, in Fox Lake, Ill. Authorities determined Gliniewicz intentionally left a staged trail at the crime scene to try to mislead first responders into believing his death was a homicide scene. Gliniewicz had significant experience with mock crime scenes as a part of his job, officials said. The investigation found criminal activity on the part of at least two other individuals, officials said today, but they would not elaborate, citing the ongoing investigation.